Finland holiday cottage. Offering a private beach area by the Gulf of Finland, this spacious and modern villa includes a fully-equipped kitchen, private sauna and private terrace. Hamina town centre is a 15-minute drive away. A fireplace, seating area and flat-screen TV feature under the high ceiling of Villa Vimpasaari. The villa has wooden interiors and a tiled bathroom with a shower, washing machine and tumble dryer. Kitchen facilities include a stove, fridge and coffee maker. Guests can enjoy their meals in the separate dining area. On-site facilities include a BBQ hut. Canoes., bicycles and fishing equipment can be rented on site. 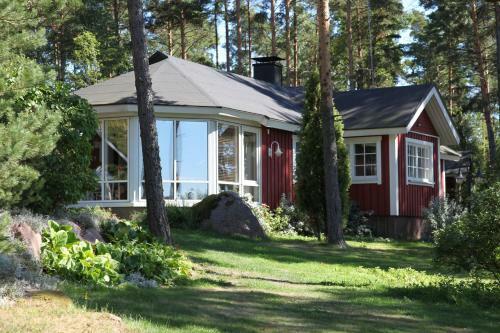 Staff at Vimpasaari Villa can help organise snow shoeing, skiing and snow mobile excursions. The nearest restaurant and grocery store are a 10-minute drive away.